The B. smithi has long been a hobby staple, and many consider this beautiful species to be the poster child of tarantula keeping. I’ve spoken to many hobbyists that admit that Brachypelma smithi was the first tarantula scientific name they ever learned, and you’ll often hear hobbyists argue that no collection can be complete without one. With this species’ “celebrity” status in the hobby, a name change is obviously a bit jarring for some, especially for folks just getting into tarantulas. Those interested in reading this paper (and it’s pretty fascinating) can follow the link below. It can be downloaded for free from the World Spider Catalog by members. Not a member? Signing up is easy and takes just a couple moments. Now, for those who might not feel like weeding through all of the technical talk and scientific jargon to get to the pith of this article, the following will be my attempt to break down the significant points. To encapsulate, the first specimen of B. smithi to be examined and identified (1897) was an immature male and not a female as originally identified. In the early 90s, the species was redescribed by Smith using what he thought to be an adult female, and the hobby smithi was born. However, when the authors of this current study cross-examined the material Smith used for this identification, they discovered that specimens he used for this new identification actually belonged to B. hamorii. 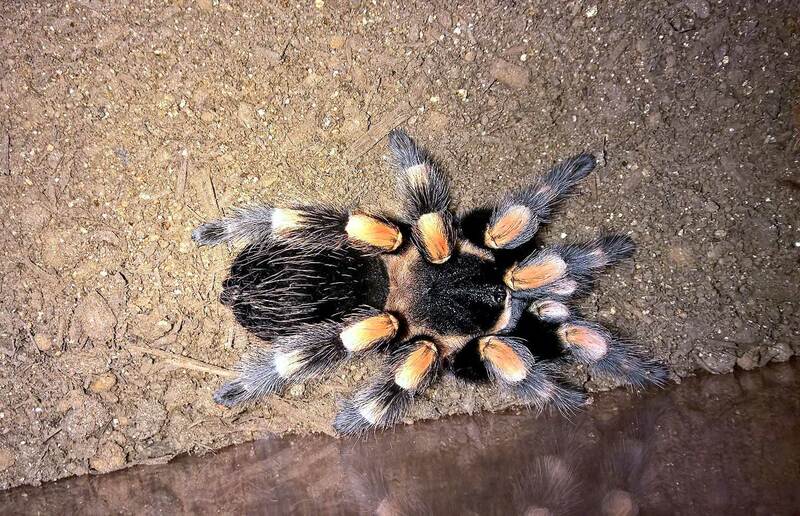 Therefore, the species that had been sold in the hobby for years under Brachypelma smithi was actually the previously described Brachypelma hamorii. Others used this misidentification as the basis for their own work, further perpetuating the error. Basically, the first misidentification and subsequent description led others who based their findings off this description to follow suit. For over 20 years, the spider we’ve referred to as a B. smithi was, in fact, the previously-described B. hamorii. Furthermore, the authors have concluded that Brachypelma annitha should now be considered a junior synonym of B. smithi. Although this is also a very important finding, it’s obviously not the piece of news getting the most attention. This is NOT the first name change for this species! As jarring as this change may be for some, it is not the first time this species has undergone a name change. 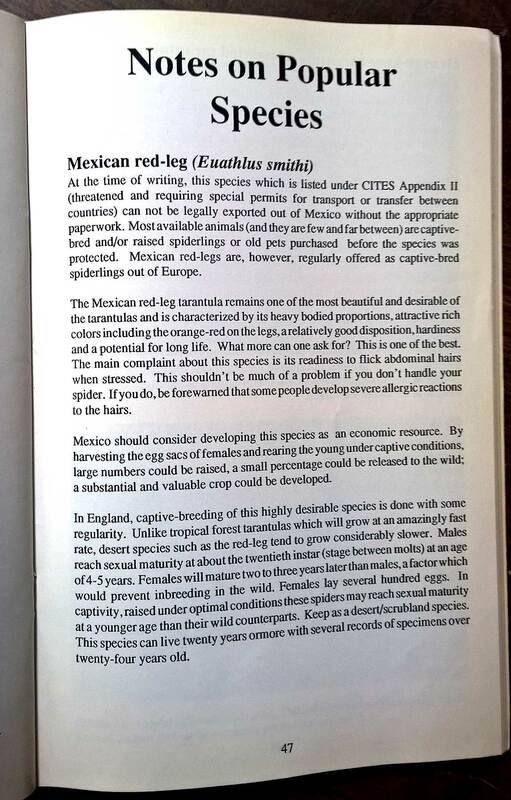 Those who were in the hobby in the ’80s and early ’90s may remember the Euathlus smithi, or Mexican red-leg or red knee. 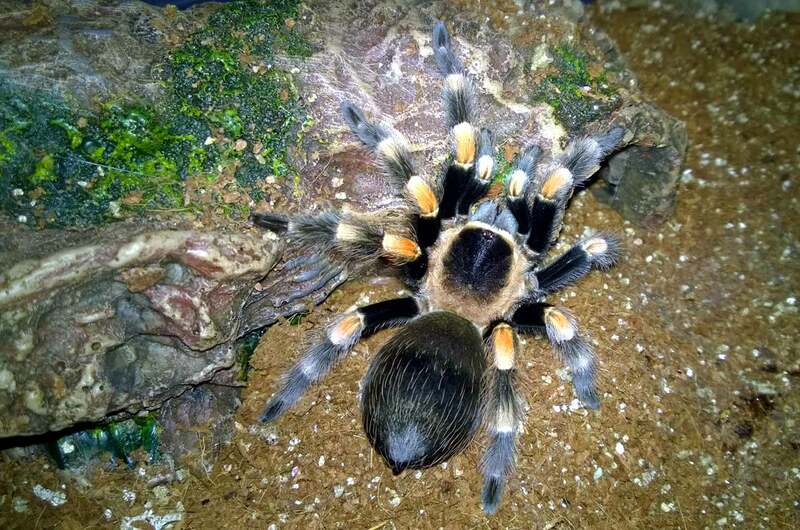 It wasn’t until the early ’90s that Brachypelma was widely accepted as the correct genus for the smithi, and Euathlus faded from use. Obviously, some folks are upset about the news, as name changes can be confusing, especially to those new to the hobby. For those with some tenure, the name B. smithi has just been such an important one for so many years, it feels odd to call it anything else. It would be like if Tom Cruise suddenly asked to be called by his birth name, Tom Mapother. It would obviously take some getting used to. However, despite how we might feel about it, the paper has been published and this change is official. Although hamorii may sound odd at first, it’ll soon catch on as current hobbyists make the transition and new folks who are just coming into the hobby do so never even aware that this spider had another name. It’s not the first name change in the hobby, and it certainly won’t be the last. As disorienting as these revisions can be, they are always a good thing. There is still so much work to be done in tarantula taxonomy, and revisions mean that scientists are taking the time to study the creatures we love. What’s the difference between the two anyway? Besides some subtle differences in the appearances of the two species, including variances in the colors of their legs, carapaces, and cheliceral banding, these species look a lot a like. Most hobbyists would likely have great difficulty distinguishing between the two. The authors of this article also looked at sexual characteristics, including male emboli and female spermatheca. Descriptions of these physiological differences, as well as photos of these differences, can be found in the paper. The two species come from different regions of Mexico and are separated by the geographical boundary of the Balsas River basin. B. hamorii are found in the more northern states of Colima, Jalisco, and the northwest coast of Michoacán. B. smithi is found on the Pacific coast of Guerrero. Several other species of Brachypelma are also found between them, including B. baumgarteni, B. boehmei, and B. auratum. So, they are essentially two sister species from two different regions. As the news quickly spread through the community, I’ve heard the battle cries of some of the newer (and bit rebellious) hobbyists who are choosing to boycott the revision. Although I appreciate and understand the sentiment, a grassroots rebellion isn’t going to be realistic or effective. Many dealers had already changed the names on their sites in anticipation of the paper, and folks on YouTube, Facebook, and message boards were quick to adapt the new moniker. Name changes are always a part of the hobby (although they don’t often impact such a popular species). Listening to the buzz, I’ve heard a few ideas and questions repeated frequently. Why does it matter that someone changed the name? I’m just going to ignore it. Unfortunately, that’s not how it works. This isn’t some just some random name change proposed by a hobbyist. The change is part of a scientific taxonomic study conducted by experts who then published their findings in a peer-reviewed journal. The change is as official as official can be. It will not be changing back (well, at least for now). For those just getting into tarantulas, be aware that name changes are just a part of the hobby. Why not just call it B. smithi “hobby form”? The phrase “hobby form” is used in the hobby to designate species that have not been described or that there is some uncertainty about. In some instances, the bloodline of species in the hobby is thought to be polluted by cross breeding or different than specimens found in the wild (for example, B. albopilosum). In some instances, hobbyists have been referring to a species by the wrong name due to confusion over where the species originated from (true Pamphobeteus antinous vs. hobby form). That term would not be applicable in this case, as the B. hamorii has been described. If it were revealed that the B. smithi and hamorii had been mistakenly cross bred, and these offspring were in the hobby, then it might apply. Why didn’t they just keep it B. smithi and change B. hamorii? This goes back to the fact that the material from B. hamorii was mistakenly used to describe the B. smithi (the species currently sold in the hobby). As the species was previously described, the name was changed to reflect that previously described species. Although it might not be convenient for hobbyists (I’ve heard many say that they should just change hamorii because hobbyists are used to smithi), it’s taxonomy that informs the hobby, not vice versa. If you’re one of the holdouts, it’s completely understandable. But this revision is the real deal, and the name has been officially changed in the World Spider Catalog. By this time next year, you can expect that everyone will be talking about their B. hamorris , and current husbandry information will reflect the change. The spider sold as Brachypelma smithi for years in the hobby is now Brachypelma hamorii. Brachypelma annitha is now a synonym for Brachypelma smithi. For this paper DNA barcoding was used in conjunction with species descriptions to define species. Obviously, this name change is a pretty big deal, and keeper reactions have been understandable. Heck, I felt quite a bit of sadness as I changed the label on mine (it’s the B. smithi, for crying out loud!). That said, although revisions can be annoying, they are always a great thing. With 900+ species of tarantulas in the world, we are still a long way from having their taxonomy all sorted out. Furthermore, the fact that DNA barcoding was used in this research is incredibly exciting (and something hobbyists has wished for for years). So, get out those label makers, start practicing that pronounciation (ham-or-eye? ), and be glad that this small name change represents a pretty significant step forward for taxonomy and our hobby. Mexican wildlife protection institutes have joined with academics in a project to use barcoding to identify species. Nice breakdown of the recent change to an iconic tarantula species. If the two species are difficult to distinguish anyway, isn’t it fairly probable that the ‘red knee’ that hobbyists have dealt with for decades has been a mix of both species, and/or hybrids? It’s possible, but in the wild, there are natural boundaries between the two species. Most of the ones that have entered the hobby were from a particular region that only has the B. hamorii. Still, who knows if any cross-breeding has occurred.